Earlier this month, 13 engineering students created a mini-library for Bridgeport students through the Fairfield University chapter of Engineers Without Borders (EWB). 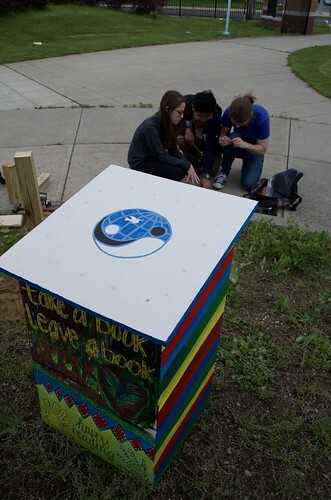 The mini-library, or a small, free-standing wooden bookcase that's based on a 'take-a-book, give-a-book' system, now installed at the Cesar A. Batalla Elementary School in Bridgeport, was built by Fairfield students and painted by the Batalla School’s HOPE club with the intent of promoting community literacy. “Since our international project with Bolivia has come to an end, we as a club wanted to start a new, local project to give back to our community,” said Christina Ficaro '18, a junior mechanical engineering student and co-president of EWB who helped design, build, implement the library and collected book donations. Bryan Ripley-Crandall, PhD, assistant professor of the practice of curriculum and instruction and director of the Connecticut Writing Project in the Graduate School of Education and Allied Professions, assisted with the project by connecting EWB students to Jessica Baldizon who serves as the faculty adviser for the school's HOPE Club. EWB, a national organization since 2002, partners with communities in need to meet their basic human needs and equips leaders to solve pressing challenges in some of the world’s toughest places. Though established only two years ago, Fairfield’s EWB chapter has been busy creating a clean water filtration system in Carmen Pampa, Bolivia, with their partner school, Universidad Academica Campesina. The Bolvia project was completed this past winter and the club will now travel to Nicaragua to begin it’s next international clean water venture. Pictured: (l-r) Eric Jiang '20, Kacper Laska '18 and Christina Ficaro '18 with their mini-library at the Cesar A. Batalla School in Bridgeport, Conn. Library dimensions are 18" wide x 30" tall x 16" deep. See photos of the mini-free library. Learn why Fairfield is Among Best in the Country for STEM Education. Want to be an engineer? Check out the School of Engineering's programs.